This premium education WordPress theme is vibrant, colourful, fresh and lively. It imparts happy and positive vibes to the visitors. The jovial approach it carries is sure to attract visitors into taking your services. The theme is best fit for kindergartens, child care centres, preschools, nurseries, primary schools and other kids’ websites. With great scope of customizations, the theme can be used for high schools, colleges, universities, training institutes, coaching centres, LMS and for any learning academy. This education WordPress theme is well built on Bootstrap framework to ease its usage for WordPress newbie as well as webmasters. The user-friendly interface of front-end and back-end enhances its usability to both website admin and visitor equally. The theme’s clean design leads to hassle-free navigation. Users will instantly find what they are looking for within moments of landing on the site without wandering here and there. Your site will stand strong against any security breach thanks to its clean and secure code. 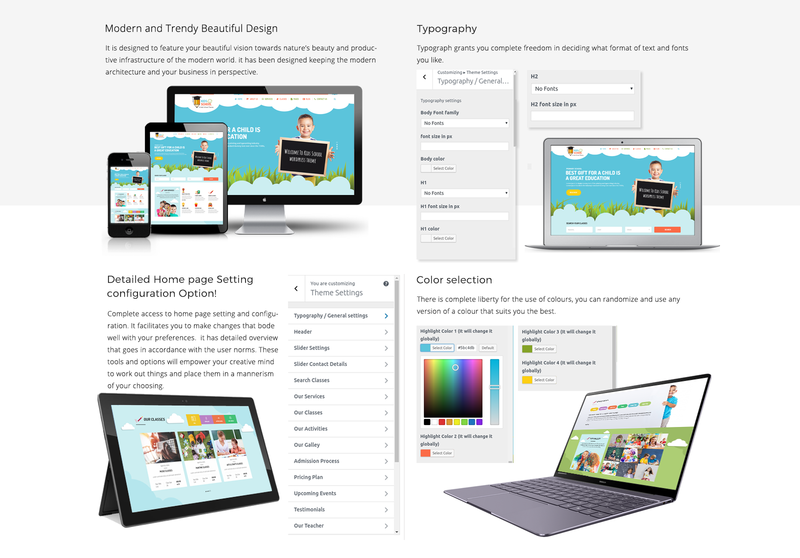 The whole design of the premium education theme maintains a flow that binds visitors to explore everything about you and convert mere site visitors into potential customers. The education WordPress theme is flooded with exclusive features and functionality to design a professional looking stunning kids website. The theme has a responsive layout that adjusts seamlessly on any device size looking nothing but beautiful. Its cross-browser compatibility makes it load on various browsers. The effortless customization it provides helps change the background, colour, logo, header, footer, menu and various other elements in just few clicks. You can even see the effect of these changes through live customizer at the run-time before making them live. The process of customization is further eased out with the use of documentation provided along with the theme. Its design pattern is sure to boost your SEO rank. The theme is translation ready and has compatibility with WPML plugin to help serve in any global or local language. The premium theme has a gallery to showcase your services and work to gain more customers. It has a testimonial section and a newsletter area to get in contact with customers. Each section can be enabled/disabled separately. The theme is integrated with social media icons to reach wider audience through networking sites. The premium version of education WordPress theme provides support and regular theme updates to ensure smooth working of your site. Support is also provided to add custom CSS/JS.